Complete the look of your bed with the Sawyer Mill Bed Skirt. The skirt's graceful 16" drop and gathered ruffle is preceded with dark creme and charcoal grey stripes. I like this bedskirt. The colors are true to the photos. The material is thin, like flour sack....But overall pretty nice. I didn't like how long it was in drop, so I hiked it up a bit. Not sure if I mismeasured or if the drop is wrong. Obviously liked it enough to keep it and will be buying a couple more for new bed purchased. Nice bed skirt and long enough to cover mattress. Goes well with the Sawyer Mill quilt set. The skirt fit my bed perfectly! This is a very pretty striped dust ruffle that contrasts so nicely with the patchwork Sawyer Mill quilt that I also bought, and it matches perfectly with the striped pillowcases, Love! Looks fantastic, colors as described and fits bed nicely. 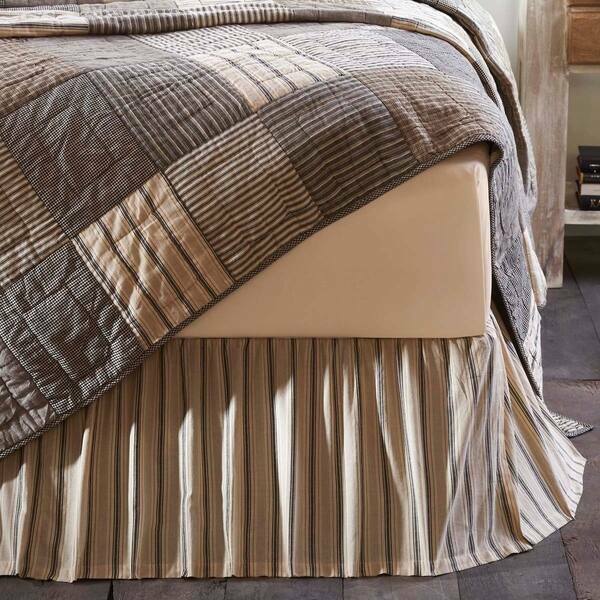 We love the Sawyer mill coordinating bed skirt for our Sawyer mill quilt set. It has a vintage look and feels super soft. Great quality. Would definitely order from them again. Highly recommend. I really like the look of the Sawyer Mill items. All of their products are great quality. It matches my quilt coverlet perfectly. Would recommend for sure. High quality bed skirt! I love the entire Sawyer Mill Collection!! VHC makes great quality bedding!! Purchased the entire bed set, good quality and looks great in my farmhouse styled guest bedroom! I have not put the skirt on yet . The matching bedspread is long enough and there is no need for the skirt. Looks great. Love the length and matches quilt and pillows perfect. I bought this bedskirt to compliment the other Sawyer Mill products I bought to make a complete set. It is so gorgeous and I highly recommend this bedskirt! I completed the whole set perfectly! I bought two of these bedskirts to go with the two Farmhouse Bedding Miller Farm Quilts I purchased. They are a good size. They go all the way down to the floor. They have plenty of fabric to cover everything that needs covering. Lovely bedskirt for the look that I wanted. Material seems pretty nice. Bedskirts don’t get washed very often so it would be hard to say how good the material will hold up. A great compliment to the rest of the bedding! "what is the difference between the luxury king & regular king?" The Luxury King dimensions are 120 W x 105 L. The regular King is 105 W x 95 L.
Great Price! Beautiful and exactly the Farmhouse style I was looking for.